I’m from Chicago. We all are who we are due, in no small part, to our inherited beginnings, our genes. In a similar sense, that applies to our childhood roots. Although my younger sister and I came to California in 1948 and have spent much of our lives here in the San Francisco Bay Area, it seems that I have never lost the taste in my mouth of Chicago. Chicago and the Midwest can stay with one for a long time. I was flabbergasted many years ago – and many years after we came to California – to be asked by someone out of the blue if I were from Chicago! I replied, “Yes, what prompted you to ask that?” I was told that I had a Chicago accent! “I do?” I thought to myself; amazing! We left in early 1948 when United Air Lines transferred my father to SFO (airline code for San Francisco) along with their maintenance operations. I was seven at the time. I recall the long flight on a DC-4 United Mainliner which left virtually all of our family-ties behind and carried our young family into a great unknown. Aside from a brief return visit in 1951, we never returned. A temporary stay in a small motel along the Bayshore Freeway (also known as Highway 101) in San Mateo, revealed to us a landscape (sparse) and a way of life which promised to be very different from what we left behind. Now, after sixty-five years in California, most of it in the Bay Area, this area is barely recognizable from what we first saw in 1948! Through all the years, I kept alive memories of our West Chicago neighborhood, my boyhood friends, my grandparents, uncles and aunts, and weekend fishing and boating trips north to Lake Loon and Lake Geneva. That’s me next to my sister, Karen, in front of our apartment building. I remembered the wonderful Lionel electric train layout at the Museum of Science and Industry at Lakefront Park. I recalled the famous and elaborate Christmas window displays at the venerable Marshall Field department store on State Street. And the snow – we kids loved the snow and sledding down the gentle slopes in the vacant lot across the street from our apartment building. How often I thought about these things, and how often I missed family ties which were suddenly severed when we left. I was old enough to form some vivid memories of my grandparents, but not old enough to really know them and to benefit from their life-experiences as I grew. I have always regretted not being able to truly know them, especially now when I wonder to what degree their attitudes and sensibilities are present in me, our children, and our grandchildren. 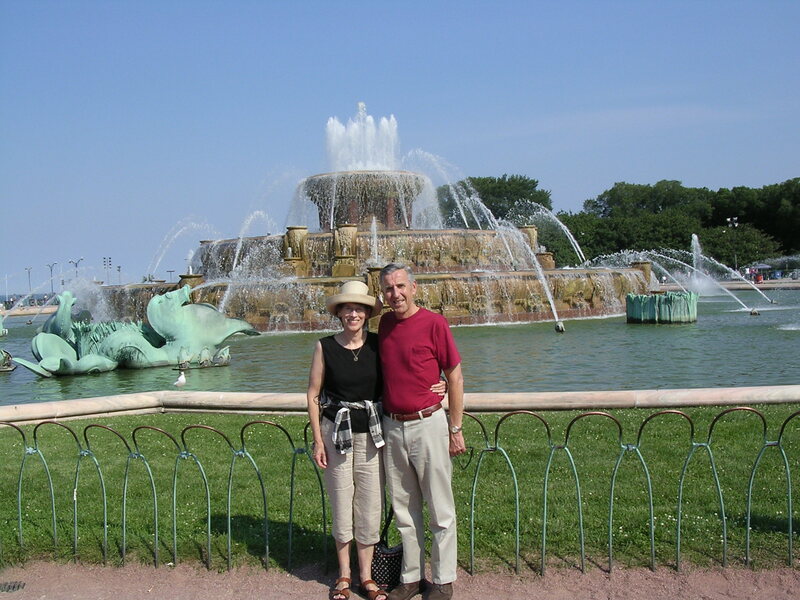 Fifty six years after my departure, Linda and I decided to return to Chicago on vacation – to revisit those places which stubbornly resided in my memory all those years. Would anything remain, and, if so, would it at all resemble those mental images I had carried around for so long? We hired a town car for one full day during our stay with the express desire to visit the old places. Our driver, Steven, came for us in his black Lincoln town-car at our Oak Park B&B at 10 AM one bright, sunny morning, and off we went on one very special personal adventure. Our first stop was the nearby neighborhood and apartment building which contained many of my boyhood recollections. 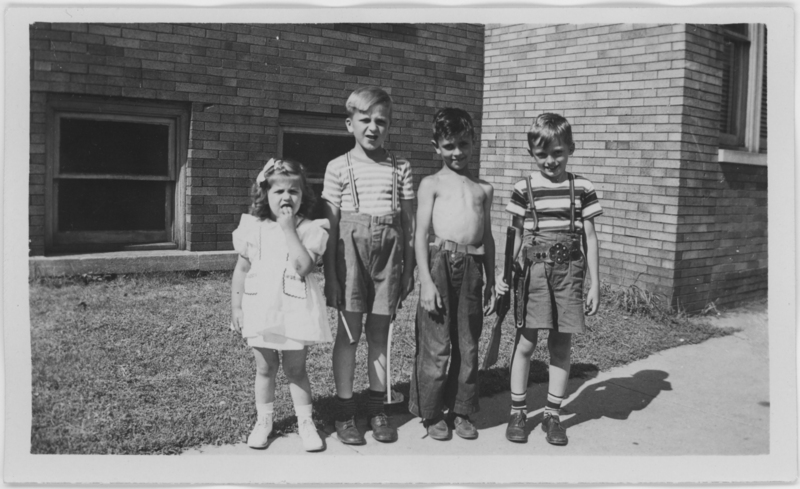 As we pulled up at the curb, I saw that the venerable old brick building was not only still there – it had not changed one bit from the old black and white photos which captured me, my playmates, and my sister Karen playing along the front of the building so many years ago. The garage at the left facing the alley was where my dad completely overhauled the engine of our 1934 Pontiac when it threw a piston in the mid 1940’s! Our tiny apartment was located in the far wing of the building closest to the sidewalk – the upper two windows nearest the camera. 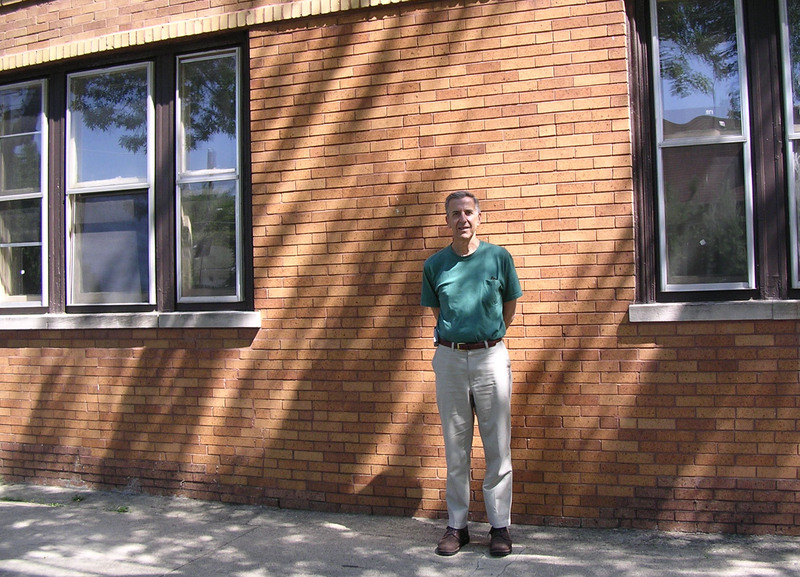 These two photos are of the same guy and the same windows (to my right in the 2004 photo); 59 years had passed, and I must admit that the building had changed much less than the guy. An interesting anecdote will support that contention: I was not sure which of two sets of identical windows was pictured in the early photo. Later, when I carefully inspected both prints with a magnifying glass, I could recognize the exact same pattern of light/dark bricks under the windows to my right as were identifiable in the black and white shot! Elementary detective work, my dear Watson! Next, we drove several miles to the little brick home of my maternal grandparents, a house which figured in so many of my memories. It had a real attic, a wonderful, rough-finished attic where old trunks and other things were stored. It was the kind of attic in which little folks could run around upright and have a ball. The house also had a full basement with little windows at ground-level and a great big furnace. To feed that fiery beast during the heavy cold of Chicago winters, a large walk-in coal bin and a shovel were nearby! My grandfather and grandmother both arrived in New York from Poland as young, single adults. Grandpa was very proud of the fact that he became a naturalized citizen and that he was living the American dream when he bought this brand new house in 1938 – his first and only. He was a barber for many, many years just across from City Hall in Chicago’s Loop. He had a large repeat clientele which included many city big-wigs from across the street. Grandpa was a no-nonsense kind of guy – short, stocky, and stern in demeanor, but dutiful, hard-working, and apparently, very honest. There were fun times for me at the house: Going up and down the circular attic staircase with my sister; sitting in a huge galvanized wash-tub filled with cool water in the backyard on very hot Chicago days (the pungent smell of that galvanized tub is as vivid today in my memory as it was back in the mid-1940’s). I recall, as well, humid Chicago evenings when we all sat in the back yard as it got dark eating fresh garden tomatoes with one hand with a salt-shaker in the other. I never forgot those wonderful Chicago fireflies which seemed like nature’s magic. One of my favorite memories involves the weekend afternoon I was following Grandpa all around his house; I was probably around four or five years of age. Down to the basement, back up into the house, out to the back-yard, and back again inside we went. He apparently was quite busy that day, and I presumably had nothing better to do than to follow him around asking questions, etc. At one point in this parade of two, I locked him out of the house. When he was let back in, he blurted out his frustration for the benefit of anyone within earshot, “He’s a nuisance! !” Now, I did not know exactly what that word, “nuisance,” meant. I recall thinking it might have something to do with “newspaper.” I probably was exactly what he said I was – on that particular day! As with our old apartment building, my grandparents’ little house was virtually unchanged through all those years. Even the wrought-iron hand-rails framing the several front steps were the exact same ones pictured in keepsake photos we have of the early days. My mother was photographed in her wedding dress on those steps in 1939. My parent’s wedding reception was held at the house in the backyard which faced the unfinished “field” behind the newly constructed house. 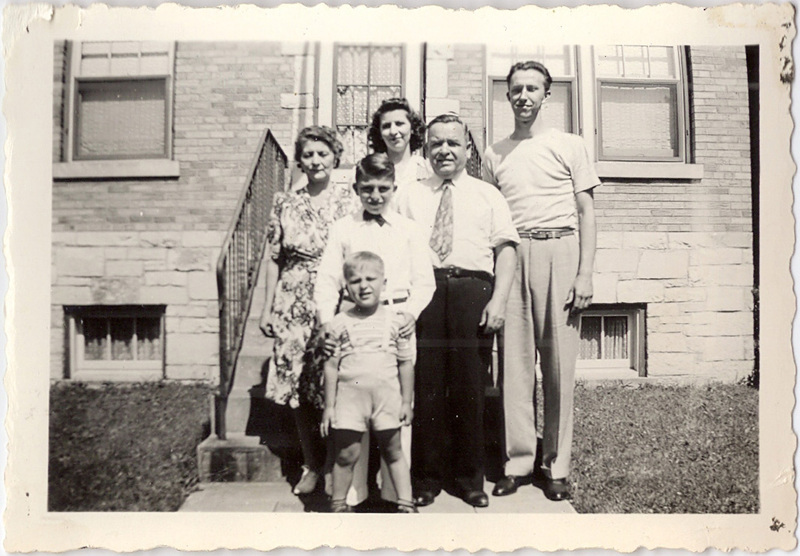 And, finally, there is my personal favorite, a photo taken in August of 1944 of me, my parents, grandparents, and my young Uncle Edwin by the front steps. I cannot fully explain my affection for this particular picture, but I feel it in part because it somehow embodies the mysteries of time, space, and family for me. There were other sentimental family stops for our town car that day. Several involved the earliest residences of my parents and me. The major disappointment of the day was our inability to locate my paternal grandparent’s store-front/home on Diversey Avenue. Elmer and Martha lived very frugally directly behind their little store-front which combined a radio repair shop (Elmer’s) and a candy/toy store (Martha’s). 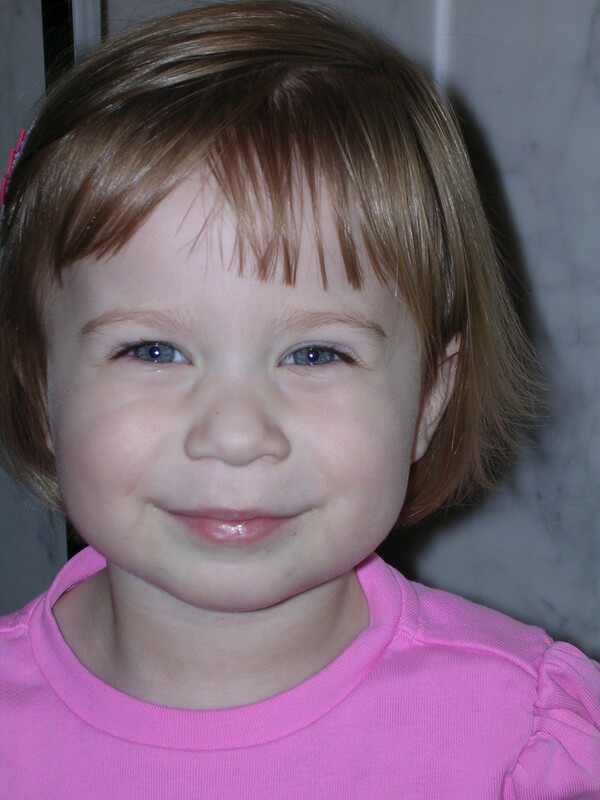 She emigrated from Germany early in the last century; Elmer’s parents came from the German-Polish border. Dad’s parents had little money throughout their lives, yet managed to raise five children who carved-out a good, successful life for themselves and their families. After returning home, we surmised that the little premises we sought once occupied a site now covered by a large, modern banquet-hall/restaurant which we had photographed. One more stop was noteworthy: We went up Milwaukee Avenue, northwest of Chicago proper, to visit my mother’s old high school, Carl Schurz High. Given the fact that it was built in 1910 (she graduated in 1936), I did not expect much more than a dingy, dilapidated facility. I was totally blown-away when we got out of the car; there before us was this stately old, meticulously maintained, classic brick school building situated on a gorgeous, fenced campus. 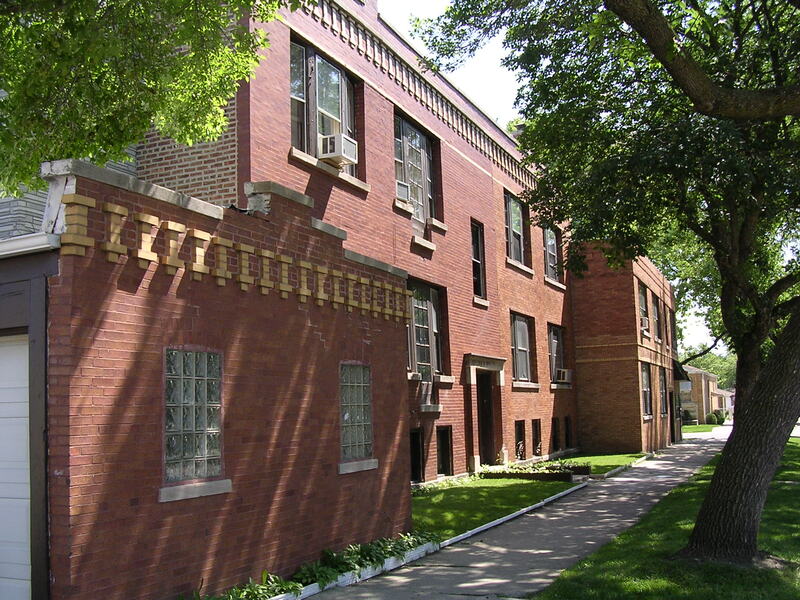 We learned afterward that Schurz underwent a full-blown, loving restoration in 1997 and is now listed as a Chicago Historical Monument, being a beautiful example of the “Prairie Style” of architecture, reminiscent of Frank Lloyd Wright’s pioneering style in nearby Oak Park. What a beautiful surprise this school was to me – to see such a fine and noble structure knowing that it was an important part of my mother’s early life. She had fond memories of her years there in spite of the social disadvantages of being so young when she graduated – she was sixteen or barely seventeen. Education and learning were always important to her. Nevertheless, alongside her senior yearbook picture, she declared she “wants to become a dramatic actress.” During that heyday of the movies, that was a common yearbook sentiment, it seems. My sister, Karen, and I are glad she opted for home-maker and mother. Our desire to visit my Chicago roots was fulfilled after the first few days. 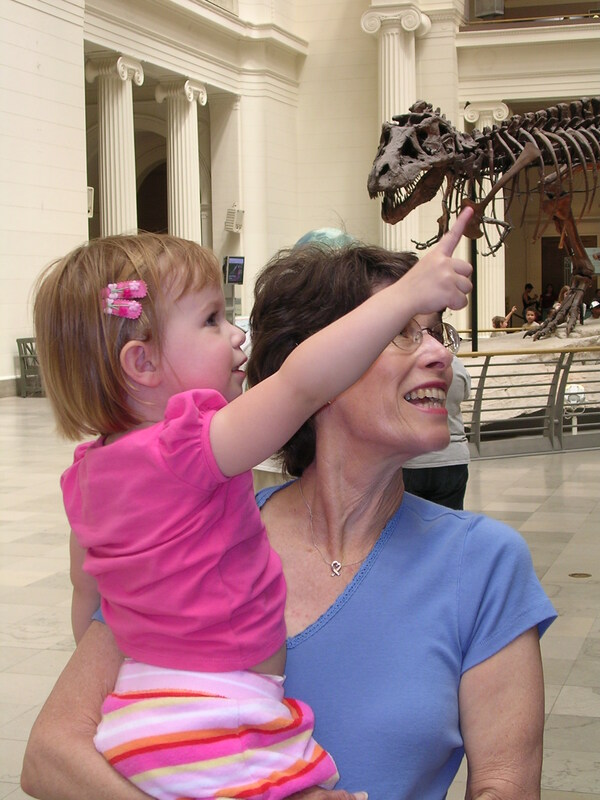 By pre-arrangement, our older daughter, son-in-law, and first grandchild, Megan, joined us in Chicago for several days. We all had a wonderful time in Chicago; there is so much to see and do there. In concluding this post, I want to add one more comment: As with Schurz High School, I was deeply impressed by the beauty, cleanliness, and wonderful spirit of my first home, Chicago – not what I expected from a big city! So clean, so fine, and so much to see and do. For me, returning to my boyhood roots …and seeing so much still unchanged was a life-long dream come-true. My kind of town, Chicago is ! Have you experienced a similar reunion with your past? If so, please share with us by adding a comment with some details. We would all enjoy hearing about your experience! 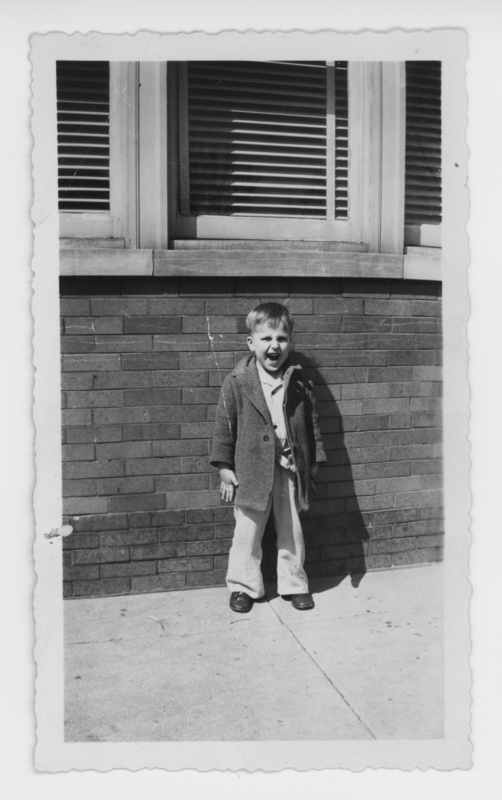 This entry was posted in Everything Else, General History, Relections on Life and tagged boyhood places, boyhood roots, Chicago, Schurz High School by Alan. Bookmark the permalink. Since I am 4 years younger than you, my recollections of Chicago are very hazy. I think they mainly come from stories and photos of the 3 short years I lived there. Having taken the same route to the Chicago past 4 years ago with our grandson, Scott, who was 10 at the time, I found the experience very emotional. Picturing our family in my mind’s eye, including Mom and you taking me for rides down Wrightwood Avenue in the baby buggy, was quite a trip! Thanks for the memories, Alan. I’m so happy we have each other and that we share these special memories of past. It’s great that you made the trip and had a chance to see it all even though your recollections are dim. I think a version of the old adage applies in my case, “You can take the boy out of Chicago, but you can’t take Chicago out of the boy.” Those roots have always remained with me.